Earlier this week, the High Court handed down its decision in the matter of Thorne & Kennedy  HCA 49. This case was an appeal from a decision of the Full Court of the Family Court of Australia regarding the enforceability of pre-nuptial and post nuptial agreements in certain circumstances. The parties met on the internet in 2006. At the time, Ms Thorne was 36 years old woman, with no substantial assets. She spoke Greek and some limited English and was living in the Middle East. Mr Kennedy was a 67 year old Greek property developer, living in Australia. He had assets worth between $18 million and $24 million. In February 2007, after having known each other for approximately 7 months, Ms Thorne moved to Australia to live with Mr Kennedy. The parties intended to be married and a wedding was arranged for 30 September 2007. The event was organised and Ms Thorne’s family was flown to Australia by Mr Kennedy for the occasion. In August 2007, Mr Kennedy instructed solicitors to prepare a pre-nuptial Binding Financial Agreement (“BFA”). Ms Thorne was made aware of this on or around 19 September 2007 when Mr Kennedy told her they would be going to solicitors to sign an agreement regarding what was to happen with his money. Mr Kennedy told Ms Thorne that, were she to refuse to sign the agreement, the wedding could not go ahead. After requesting some minor alterations, Ms Thorne signed the agreement. The wedding went ahead as planned. At the time Ms Thorne entered into the BFA, and when she signed a second, post-nuptial, BFA in terms substantially identical to the fist, she was advised by her lawyer that it was adverse to her interests to sign and that she should not do so. On 16 June 2011, the parties separated. In April 2012, Ms Thorne commenced proceedings, arguing that the two BFAs should be set aside on the basis that her agreement was obtained as a result of undue influence or unconscionable conduct. Essentially, she argued that, by virtue of her circumstances, she had been pressured into signing the agreement. the public nature of the upcoming marriage. Ms Thorne’s interest concerned only the provision that would be made for her in the event Mr Kennedy predeceased her. In essence, because Ms Thorne believed that her relationship with Mr Kennedy would last into perpetuity (or at least Mr Kennedy’s death) and that she consequently did not need to be concerned about what would happen to her upon separation, the Full Court found that her consent to enter into the agreement was not vitiated. The decision of the High Court has a profound effect on the way in which BFAs need to be agreed. 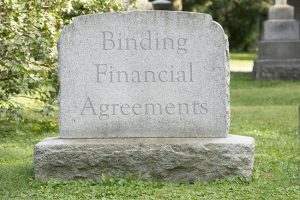 It is no longer sufficient merely to advise clients of the consequences of entering into an agreement; now a lawyer must consider the circumstances of the parties. Extra care must be taken where nuptials are pending or where there is a significant inequality of bargaining position. While the High Court were clear that it was the facts of this particular case which lead to the BFAs being voidable, the decision also opens the way for future challenges of pre-existing BFAs. BFAs, entered into where one party held the cards or where the terms of the agreement favour one party, may potentially be open to challenge. If you or one of your client’s need advice as to an existing BFA, or drafting a new BFA, then please made an appointment to see one of the team at Carr & Co. Categories: News & Alerts, Prenuptial Agreements, Property Settlement, and Separation and Divorce.